The last couple years I have felt it has been getting more and more difficult finding gifts for my husband. I know he appreciates going out to eat on Father's Day, especially to a All-You-Can-Eat buffet, so that's something we always do. However, I honestly have the worst time finding him a gift he REALLY likes beyond a delicious dinner. 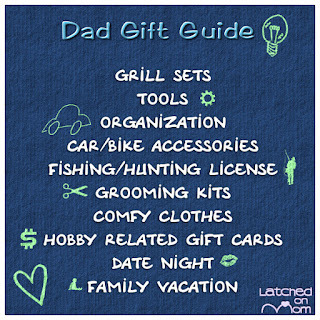 I talked about popular gifts you see frequently advertised for Father's Day with my hubby. 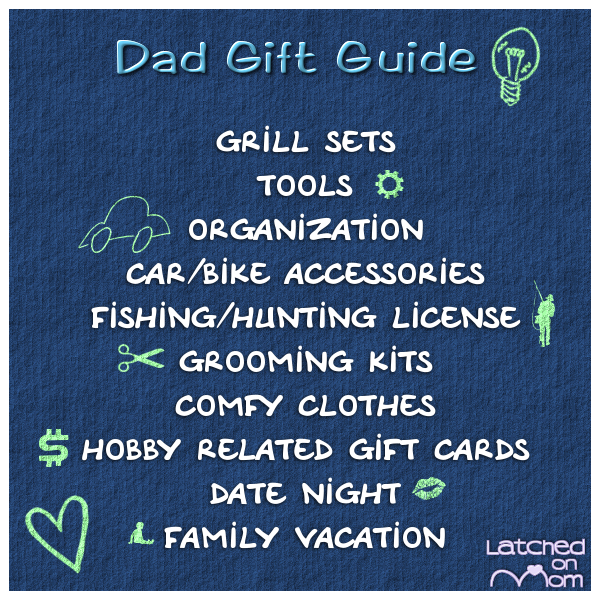 He elaborated on each gift and I'm sharing with you today a Dad Gift Guide. Grilling: My hubby prefers managing grill responsibilities, and that's fine. Grilling sets like seasonings and sauces are really popular, and he said they're the perfect gift for a dad who likes to grill. Check out the awesome Ajika all-natural seasoning set or grilling baskets like my hubby's choice- the Jim & Jack Together at Last Gift Basket on Amazon. Tools: There's always a need for tools around the house and everyone could use a good power drill. My hubby added that miter saws are convenient tools to have on hand also. There may be a specific brand you are loyal to, we primarily have Black & Decker. Car/Bike Accessories: This is going to be something that's very specific to each person, but one thing that can keep Dad safe and prepared for an emergency is a safety kit. If you're wondering what you need in the safety kit, Consumer Reports has an excellent article HERE. If you have a cyclist Dad in the family, consider browsing through the outdoor recreation products on Amazon . Fishing/Hunting License: Our family prefers wild game over hunting for meat at the grocery store. Just the time going through the woods or by the riverbed is a great stress reliever. Go HERE to find info about licenses in Iowa. Grooming Kits: My hubby uses his beard and mustache trimmer all the time. Said he couldn't get by without it! While you're at it, a nice manicure/pedicure set wouldn't hurt (and will hopefully keep them from using yours LOL)! Comfy Clothes: Think relaxation, preference AND need. Get a t-shirt that sports his favorite team or interest. You can go for pajamas, a robe, socks, whatever. My hubby always likes new clothes I buy him. You can also grab the kids and do a DIY project shirt like this BEST DAD EVER t-shirt. Hobby Related Gift Cards: aka Video Games ETC or Game Stop GC's for my hubby... but this one will go any way you think would be appreciated. Date Night: What better way to celebrate fatherhood than rekindling the sparks that started it all in the first place? Can't get out? I love this 13 Easy at Home Date Ideas for Parents by Rebel Circus! Family Vacation: Here is my suggestion- grab the kiddos, a tent and s'more ingredients then visit your nearest campground. For a few more bucks, stay the night in a hotel (with a pool). Find a few local attractions and you have yourself a fun family mini-vacation! Any other ideas I should add to this list? Let me know in the comments below! What is your family doing for dad this year?